This section deals with the instrument and recording technology used by Tomita, with attention being paid to the analogue side of things throughout the 1970's and early 1980's. 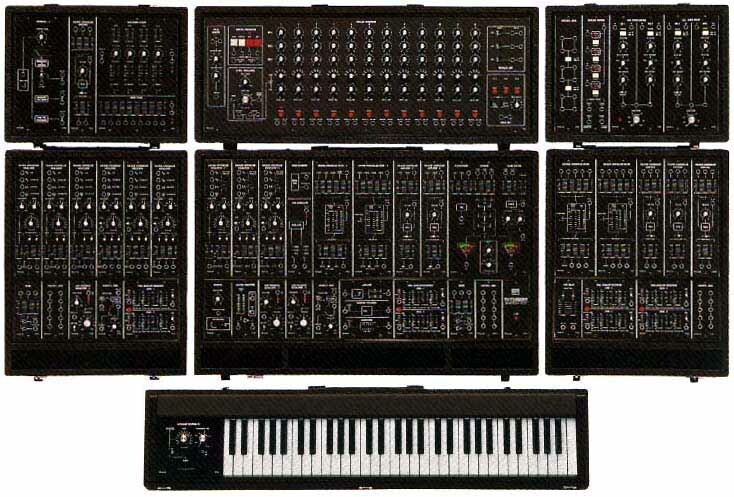 In addition, there are some photos of the synthesisers used by Tomita. Tomita was famed for using truckloads of technology, proudly listed on the back of the recordings from the start. As one of the few musicians capable of operating (let alone affording) the large modular synthesisers, manufactured by the American 'Moog' and Japanese 'Roland' companies, his productions represent a mastery of the technology that only a handful of others can equal. Part of that skill was down to necessity, as electronic music systems in the early '70's were in general almost entirely open-ended, with no facility for storage of sound programs, or a universal system of synchronisation. This meant that every setting and switch on the instruments had to be manually adjusted for each new sound, and the best memory system for recalling those settings was by using paper and pencil. 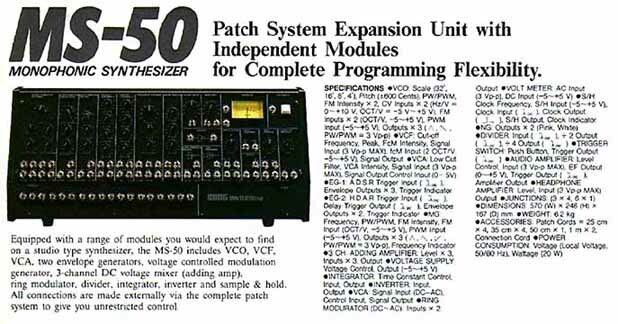 Original Moog modulars made no sound at all unless the different modules were connected to one another with patch leads. This made music making a very time-consuming and tedious process, a situation made worse by the limited number of tracks able to be recorded on the tape recorders of the day. This is in contrast to today, where a majority of instruments have a large number of microprocessor memories for instant recall of a favoured setting (or 'patch'), and a theoretically unlimited number of parts can be recorded on your desktop computer. 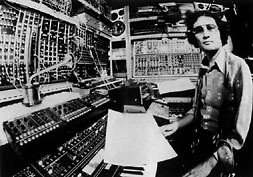 Tomita's first Moog synthesiser was a non-stock instrument, as in 1972 when he acquired his, some systems were put together according to the customer's particular requirements. However, Tomita's instrument was based on the Moog 'C' systems, roughly equivalent to the production IIIP [45k JPEG]. To thicken the plot a bit, the 'C' stood for 'Cabinet', with the instrument built into nice walnut cases, and the 'P' was for 'Portable', being the same electronics in more road-worthy Tolex covered flight cases. 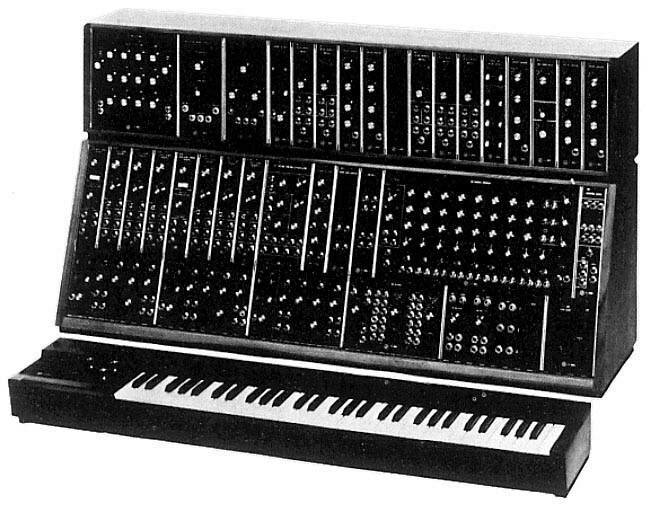 The "pick 'n' mix" approach could never have been particularly lucrative for the manufacturer, and later Moog systems were sold as entire systems. His other main tool at this time was the Mellotron 400 [24k JPEG], a keyboard instrument for playing back recordings of real sounds. Each key was attached to a length of magnetic tape, which was run over a tape playback head when a key was struck. It was a unique instrument, now superceded by its digital antecedent, the sampler. 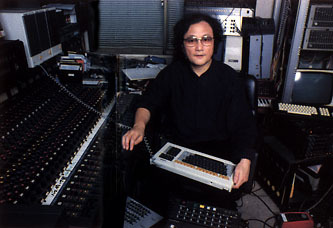 Tomita in 1973, with the 3P-type Moog modular. With the success of the first album, 'Snowflakes Are Dancing', in 1974, the quantity and range of equipment began to expand. 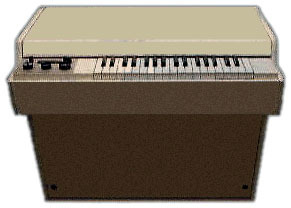 By the time of 'Firebird', the Moog had been substantially upgraded, and other instruments had been introduced to augment the Tomita sound arsenal. This level of growth continued throughout these earlier albums, and by the time of 'The Planets', the first Roland gear was used. This is perhaps Tomita's most 'broad' album sonically, and the increase in number of tape recording tracks was clearly the result of the productions becoming more complex. 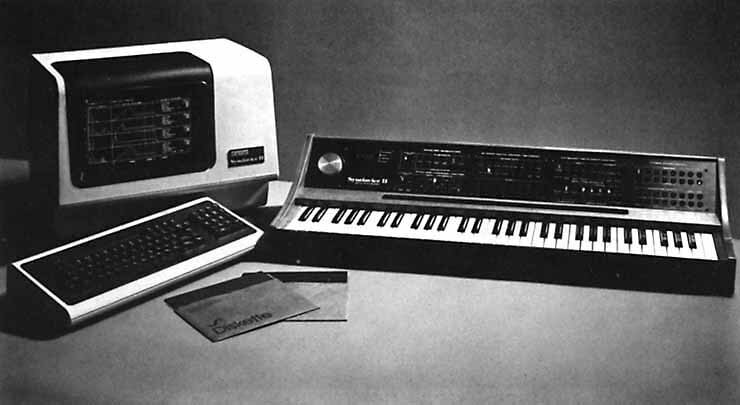 The first widely-available polyphonic synthesiser in the world was the Moog Polymoog [51k JPEG], and it debuted on 1978's 'Kosmos'. 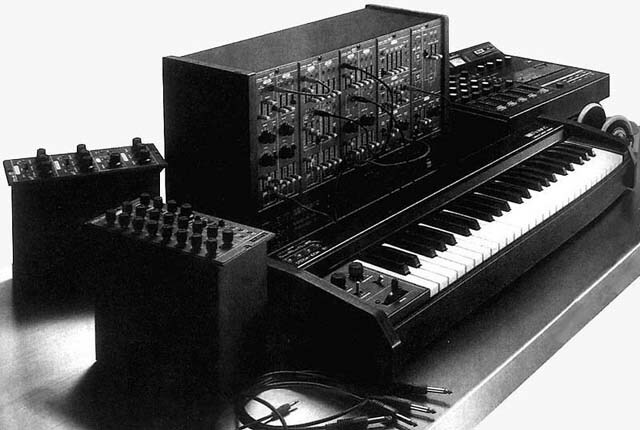 Also acquired at this time was the full, massive Roland System 700 [82k JPEG], the Japanese take in modular systems (and thought to be better in some ways to Moogs, filter-wise anyway, although lacking in bottom-end), and the current Moog modular, the Moog System 55 [80k JPEG]. 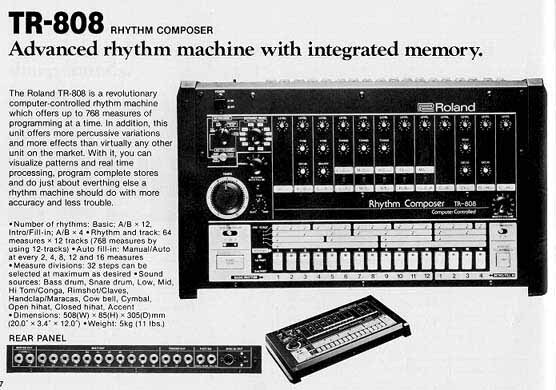 Having been used first on 'Kosmos', the Roland MicroComposer MC-8 [78k JPEG] was a major player in 'The Bermuda Triangle', and another first of its kind for Roland. A precursor to the hardware sequencer boom of the '80's, it enabled eight parts to be played simultaneously, through digital control. Tomita himself explains it all in the sleeve notes from the album. Tomita reached the peak of analogue overkill on 'Daphnis et Chloé', with a clutch of new gear, including the Yamaha CS-80 polyphonic and the Roland Vocoder VP-330 [32k JPEG]. Around this time, those well-used analogue tape machines were about to witness the dawn of digital multitrack recorders, with the 3M and SoundStream systems. 'Grand Canyon' was the first Tomita album for two years, and also the advent of the first digital system, namely the Synclavier II [40k JPEG]. Hugely expensive, half of its power came from its ability to record and playback samples of real instruments, but was somewhat let down by the fact that it had only one mono output on the back (in its basic configuration, anyway)! 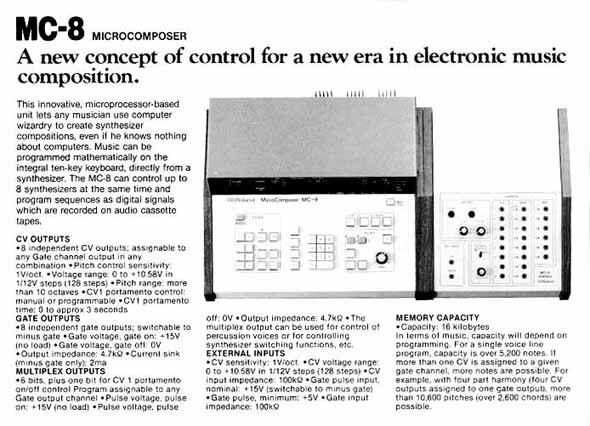 Digital instruments were easier to control and use with the benefit of MIDI*. Also present was the Emu Emulator [28k JPEG], another large modular, the Roland System 100M [68k JPEG], one of the most popular polyphonics, the Sequential Circuits Prophet-5, and the future hip-hop workhorse, the Roland TR-808 drum machine [62k JPEG]. * MIDI is an acronym for Musical Instrument Digital Interface. Previous to its introduction in 1983, electronic musicians had to contend with a number of arcane methods of synchronisation when trying to get two instruments from two different manufactures to communicate with one another. Synchronisation was required in order to produce more than one sound at once, or to be able to automatically and remotely control electronic instruments. MIDI is a protocol, or set of rules which determines how this communication occurs. 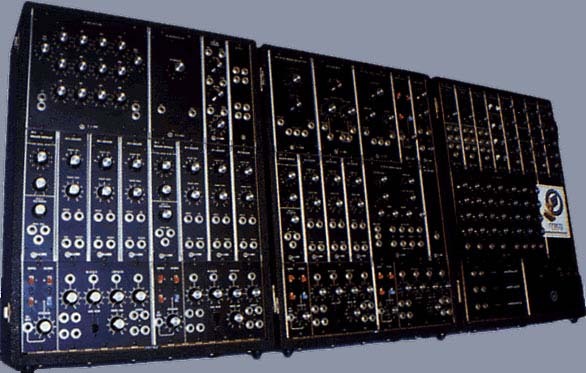 All manufacturers have adopted this system, and virtually all modern instruments can be directly connected via a common set of interface sockets. To not implement MIDI these days on an instrument would in general make it un'sync'able, and therefore seriously damage its sales potential to a large number of musicians. For pre-MIDI instruments, special interface units are available, which can translate control voltages and trigger signals into MIDI signals, and vice-versa. Hence, these instruments have been given an unexpected and indefinite new working life. There has been a commensurate worldwide boom in the market for these old analogue devices. After he listed the instruments used for 'Dawn Chorus' as being derived from the explosions of stars, Tomita abandoned the practise of spelling out what gear he used. But in 1984, he acquired the Casio Cosmo Music Computer, built as a one-off to his specifications, and this appears to have been used on each subsequent recording. He has also used the Fairlight CMI (Computer Musical Instrument), and CMI series 3. 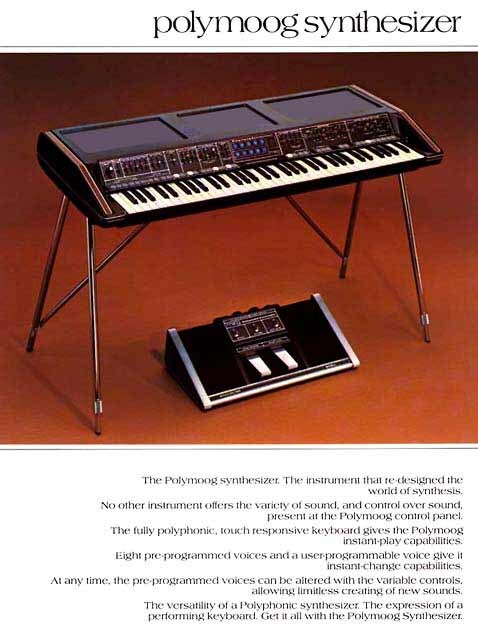 This was similar in concept to the Synclavier II. The newest recording, 'Bach Fantasy' uses samples of the analogue modular systems of old to create the music. [68k JPEG] on top of a Synclavier II screen behind him.